Wow!! What a ride. 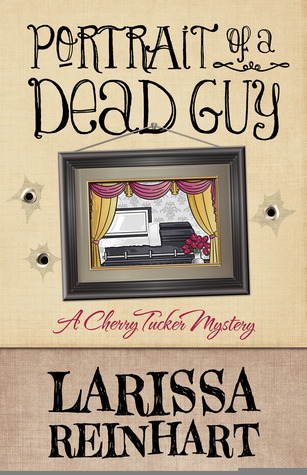 I read the first Cherry Tucker Mystery, Portrait of a Dead Guy, but this one was the best. This book grabbed my attention from the very beginning and kept it through the whole book. Cherry was relentless in trying to find out what happened to her best friend, Eloise. This shows true friendship. She didn't even care if she made her cop boyfriend, Luke, mad in the process. She also gets herself into some dangerous and humorous scraps at times. I guess I can relate a lot to Cherry because I live in an area that is really similar to the where she lives, we are both country girls! This cozy had everything that makes a great cozy; humor, food, intrigue, and it kept me guessing till the very end. Very good job. Can't wait to read the next in the Cherry Tucker series. 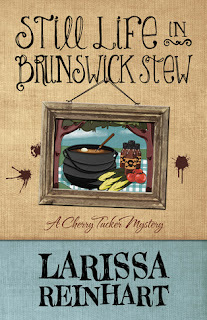 Larissa Reinhart loves small town characters, particularly sassy women with a penchant for trouble. STILL LIFE IN BRUNSWICK STEW (May 2013) is the second in the Cherry Tucker Mystery Series. The first, PORTRAIT OF A DEAD GUY, is a 2012 Daphne du Maurier finalist, a 2012 The Emily finalist, and a 2011 Dixie Kane Memorial winner. She lives near Atlanta with her minions and Cairn Terrier, Biscuit. 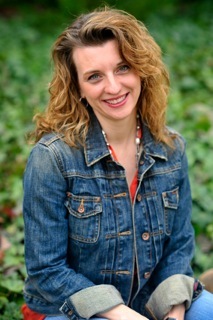 Visit her website, her Facebook page, or find her chatting with the Little Read Hens on Facebook. 1. Where did you get the inspiration for the character, Cherry Tucker? Hey Melina, thanks for having me on! I’m so glad to be here. Cherry just popped in my head one day. She’s pretty loud, so it was hard to ignore her. I do have an artist friend (artist Palmarin Merges) who is vertically challenged and feisty, although it didn’t occur to me until after I had written the second book, STILL LIFE IN BRUNSWICK STEW, that there was any similarities between the two. I had thought of Cherry Tucker as a kind of a grown Frankie Addams from Member of the Wedding by Carson McCullers. Kind of ornery, idealistic, and with a vivid imagination. I wrote a lot as a kid. Won some awards, had a column on my local paper, spent most of my childhood reading. I decided not to go into journalism (I was too introverted), but did take creative writing courses in college. At that time, writing was fun, not a professional pursuit. I dabbled a little on and off for the next twenty years, but didn’t seriously start writing again until four or five years ago when my family was living in Japan, I wasn’t working, and the children went to school full time for the first time. I started with an idea that had been bouncing around in my head for about a year, then challenged myself to see how much I could write. I finished the four hundred page story in about three months. Then I had to teach myself how to edit. That’s much harder than writing! 3. What have been your inspirations to become a writer? Love of reading and having stories or characters in my head that needed to be expressed. 4. What genre of books, besides mysteries, do you like? I’m more drawn to voice and characters than I am to genre. I read all kinds of fiction: thrillers, romance, horror, YA, literary fiction, science fiction, humor, and fantasy. (Does that cover it all?) If I pick up an author and I like their voice, I’ll read everything they write that I can reasonably get my hands on. Then I move on to another writer. I’m kind of a hit & run reader. 5. Do you write any other types of books? The first full manuscript I wrote was a paranormal young adult. I’ll probably pull it out and look at it again one day. I have a lot of ideas for Young Adult or New Adult stories that I’d like to work on, especially because my daughters are going to be able to read them in a few years. I also have an adult romantic suspense about a half-gypsy psychic that’s languishing in my computer. I’ve been too busy to do anything with it. And while I write the Cherry Tucker mysteries, I’m also working on a paranormal detective agency series set in Japan. I’m focused on getting that one published now because I’d love to continue with that series. And then there’s the dozen or so other story ideas jotted down in various notebooks. I wish I had more time! 6. What do you like to do in your spare time? All my spare time is family time. I’ve got a ten and eight-year-old daughters and a husband who are supportive of my writing, but also like to have my focus, so I don’t have much time for anything else. We love travel and take little weekend jaunts when we can. We’re hoping to have enough money to travel back to Japan next summer. 7. How many books do you have planned for the Cherry Tucker Series? Number three, HIJACK IN ABSTRACT, comes out in November (there’s also a prequel novella to PORTRAIT OF A DEAD GUY in the anthology HEARTACHE MOTEL coming out in December). I’m working on number four now, DEATH IN PERSPECTIVE, and have the mystery for number five. I’ll write as many as readers want! I’ve threaded a mystery about her missing mother throughout the books and am slowing working Cherry toward resolving that missing piece in her life book by book. Cherry’s fun to write. Her antics amuse me and I hope also amuse my readers! Thanks so much for having me on! Thanks so much for having me on today, Melina! And it's my birthday so what a great way to celebrate with that review!! Thank you! So glad you liked Still Life! Thank you foe being part of this tour! Enjoyed your interview. Book sounds fabulous. Looking forward to reading it.